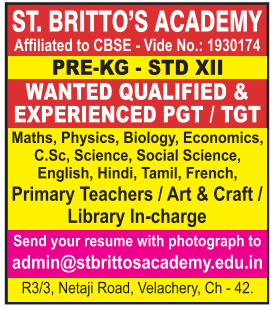 St. Britto’s Academy,Chennai ,Tamil Nadu Advertised in The Hindu paper for the Teachers recruitment 2019 – Teachers Jobs. For More Details see below. About School: St. Britto’s Academy is an International Standard school started in the year 1997 and here we stand proud stepping into the 21st year seeking inspiration from our own achievement and continuing the quest for excellence. St. Britto’s strives tirelessly, creating milestones, attaining the unattainable and creating history.In order to achieve their goal of being unique and progressive in the field of education, the school has a lot of innovative systems and facilities in place that have proved to be both creative and effective. Conscious efforts are made to inculcate reading habits and develop communication skills among the students. Therefore, it has chosen a team of efficient, committed, sincere and experienced staff to achieve their dream. They strongly believe in the Philosophy that “Form people to become competent than merely teaching”. How To Apply: Eligible candidate may apply by sending resume to following Email Id.